When the body of a young brunette is found in East River Park, marked by signs of prolonged and painful torture, Eve Dallas is catapulted back to nine years ago. A man the media tagged The Groom because he put silver rings on the fingers of his victims had the city on edge with a killing spree that took the lives of four women in fifteen days. But now, The Groom has returned - and Eve's determined to finish him. Familiar with his methods, Eve knows that he has already grabbed his next victim. When it turns out that the dead woman was employed by Eve's billionaire husband, Roarke, she brings him onto the case - a move that proves fitting when it becomes chillingly clear that the killer has made it personal. And chances are that he's working up to the biggest challenge of his illustrious career - abducting a woman who will test his skills on every level and who promises to give him days and days of pleasure before she dies: Eve. I must say, I heart the "In Death" series by J.D. Robb. They're easy to read, have a murder mystery and great characters (I love Eve & Roarke ... 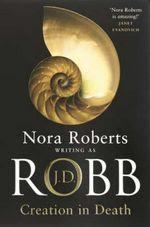 I especially love Roarke!). Looking forward to reading a few more next time I'm back in Cape Town (I think Daddio owns about the entire series! ).